Jimmy Abegg, also known as JIMMY A, is more than a rocker with a nice line in funky axe licks. He's also a thinker on the nature of creativity, as Jan Willem Vink found out. "Anete": The Greek ideal of excellence. Excellence in all things, physical, mental, philosophical. Or "Renaissance Man". The latest arty-speak for the multi-talented. Do we all have glorious technicolour talents hidden behind our grey school day inhibitions? Locked between duty and desire? American painter and guitarist Abegg believes that the Church leaves the arts by the wayside, and that people need to be stimulated into creativity. What's more, he believes creation can help us live out our faith. Pursuing this creed, he has recently released 'Entertaining Angels', his first solo album and his first outing as singer/songwriter. Honest enough to admit that it's his playing for, and friendship with, Charlie Peacock that landed the deal, the creative idyll is somewhat shattered. However, in the workaday world of crust earning Jimmy surprised Sparrow with his work and with his aim to reach both a college/alternative audience and an older audience who are "past gothic clothing and wanting to live out their dreams vicariously through someone else's music," as he told an American journalist. Jimmy has not sprung full-formed into the world. 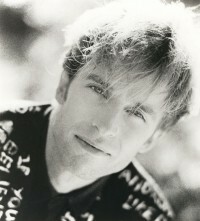 His roots are in Sacramento, where, with the 77s and Steve Scott, his band, Vector (sporting vocals by Charlie Peacock) recorded for alternative label Exit Records. Shortly after the 'Mannequin Virtue' album Charlie departed and with the arrival of Steve Griffith, Vector went on to record further albums 'Stand By' and 'Simple Experience'. In 1989 Jimmy accompanied Charlie to Nashville, a transition which was initially tough but now, with a solo album on Sparrow, is beginning to scan out. On a recent visit to Gouda, Holland, he spoke about art, the church and creation. Jan Willem: You're known as a painter and a musician. How do you see yourself? Jimmy: I do a lot of different things. I'm a painter, a father, a husband, I've three little children and I lead a very busy life, playing guitar in different settings. I play with a variety of people in Nashville, which has a vibrant music scene. Since March I've been busy with Charlie Peacock. Prior to that I was busy with a band put together by Gary Chapman, Amy Grant's husband. He's ready to do a record. He and I are good friends, so he invited me to play in his band. I do get together from time to time with a guy named Phil Madeira, who is a keyboard player. Sometimes Phil Keaggy and I have a jam session. There are a lot of occasions for me to play. That's one of the things I enjoy most. Jan Willem: Can you tell me something about your debut album, 'Entertaining Angels'? Jimmy: My first solo record is probably my eighth record with people on a label. It was the first time I recorded my singing, which is a new discovery for me. I have been singing for many years, not in the same way as Vince Ebo uses his voice, but I led worship at church for many years and pursued singing more as a means to an end than an end in itself. I don't aspire to be a great singer. I find that it's a good tool for communication. Jan Willem: How did you get your contract? Jimmy: I was invited on a couple of occasions to do a record with Vector, which is my band with Steve Griffith. There wasn't a lot of time to split between the Charlie Peacock group (which is the trio and the band) and Vector, which is basically a rock band. Identity-wise it's a whole other thing. Stylistically, as I began to pursue what I felt led to do, it was different again, different from deep down inside. Shortly after that Charlie asked me to do an album with Sparrow and of course this opened up a whole avenue of ideas. I'd never thought about doing a record myself nor had I ever pursued it. A lot of folks spend a great deal of time preparing and then pursue a deal with a company. I never did that, I was asked by a company without them hearing any of my material, aside from my work with Charlie. It was a record deal that was based on relationships, my relationship with Charlie and his relationship with Sparrow. Now on the back of it, we've made an album that, by all critical standards at least, was very good. In the US I've gotten extraordinary press and a lot of it. I was surprised. We set out to do an album that was heartfelt, honest and sincere with the highest quality that the limited amount of money would allow. As a result - a labour of love - we've gotten a lot of airplay. One of the songs has gone up to number two in many markets. We're shocked. It's called "Thin But Strong Chord", which is basically Vince, me and Charlie trading off the vocals. It's trio-wise. There are many people out there who will recognize it stylistically. I'm very happy about it. Jan Willem: Tell me some more about the songs on 'Entertaining Angels'? Jimmy: I wrote many of the songs semi-autobiographically. They're very revealing songs in a way. I was caught by surprise. As a songwriter I write by inspiration. I'm not a person who writes about bananas. I don't do that very well. I write when I find inspiration and so many of the songs are about things I felt, that I experienced. "Thin But Strong Chord" is almost about a fishing line! The line is very hard to see but for catching fish it's very strong. Sometimes I feel my faith is like this strand and I hang by this thin chord, but I know how strong it is. That's a song about faith. I wrote a couple of songs about my relationship with my wife. "Small Touch Of Love" reflects a woman's ability to do the small things, the patting on the back of a child that needs some cheering up. A man's way to do that is to buy a lot of presents and take everyone to the park and to have a big festive occasion, a celebration. It's not always true, but I find that women are able to do small little things that add up to compassion and love. "Come Children Come" is written about my relationships, forgiveness and talking things over, getting back together with God's word, finding a place of common ground, having in mind the things that are not of this earth. Having your mind set on heavenly things, as Charlie says. Jan Willem: Your song "Contemplate The Loneliness" talks more about the human side of life. Jimmy: I've got to say that's my favourite song on the record. That song to me is a way of saying "What have I got?" Think about it. So many times we're asked in the context of our faith to think about something, make a decision, all in the context of a song. And for me in a lot of songs it's enough to set forth an idea, do a little play on words and let the song speak for itself, let it draw emotions. Music is a very powerful tool. I find it a comfort and we can use it as a refuge. A song like "Contemplate The Loneliness" describes an emotion and I think it is a very accurate description. Your girlfriend asking you for some kind of commitment and then you say, "Hey, there's no such thing as promises." Once again you're left with nothing. Or after a festive occasion there's nothing left but empty ashtrays and empty glasses. I think that's part of the job of the songwriter, to inspire the listener to think. To find their place in the music. When they've made contact with that, I've achieved what I set out to do. I've brought a ray of content to their lives. Jan Willem: You're a painter too. How do you see yourself functioning in the world of the arts? Jimmy: I find that the arts in general - painting, writing a book or a poem, music - are left by the wayside by the Church. The Church functions by teaching. Many times, I think what's missing is that people are not stimulated to be creative, to find things that will help them to live out their faith. For me I happen to be moderately gifted in many areas. That gift of painting is something that I enjoy most of all. As things turn out, people also admire my work. It's like you're playing music and all of a sudden you're playing in a band and the band is very popular. It's not a thing you're planning to do. God is able to take the things that are useful and turn them into things that people find inspiration in. I get a lot of letters from kids saying it's so neat to see somebody who's a musician and a painter. I'm proud of that. It's all I have. I'm proud to show that people can pursue the arts and see it's okay to do that. Jan Willem: 'Entertaining Angels 'has some angel paintings on the cover. You seem to be quite obsessed with angels. Jimmy: The cover was inspired by our last trip to Europe. We went to the UK and performed at Greenbelt then went to Paris to view art. I found the Parisians quite rude to Americans. We were met with hostility everywhere we went. In my reading, in my Bible study, a Scripture jumped out. 'Be careful to entertain strangers, because you may be entertaining an angel.' That's the Scripture I wanted to tell to the people who were rude to me, that I might be an angel. Then it jumped out at me. Many times in my own actions when I recognize fault in other people, as a Christian, it's turned to myself. I need to correct that in myself because I can be a real jerk too, on occasion. The Holy Spirit pointed out the splinter in their eye but how about taking the beam out of my own eye? I found that Entertaining Angels became the title of a series of paintings. A couple of them are on the records. I've done six paintings and when I arrive back home, I've got several more to do. I do sketches first and then I do the paintings. The angel theme has been fascinating for me because it gives a chance for me to incorporate my spirituality in a way that is not so obvious for the non-believer. The painting that's on the CD is very obviously an angel. The one that's on the cover in the background is an angel painting but they don't always look like angels. What do angels look like? No one really knows. The descriptions that are found in Scripture could not be painted because some angels have nine or 10 sets of wings. They're really elaborate. It's an area of mystery and intrigue. That's why the angel paintings I paint are very different. Jan Willem Vink is a regular contributor to Cross Rhythms and lives in the Netherlands. Jimmy A releases album through Sparrow Records. Sammy Horner: Come in Number 6... your time is up!